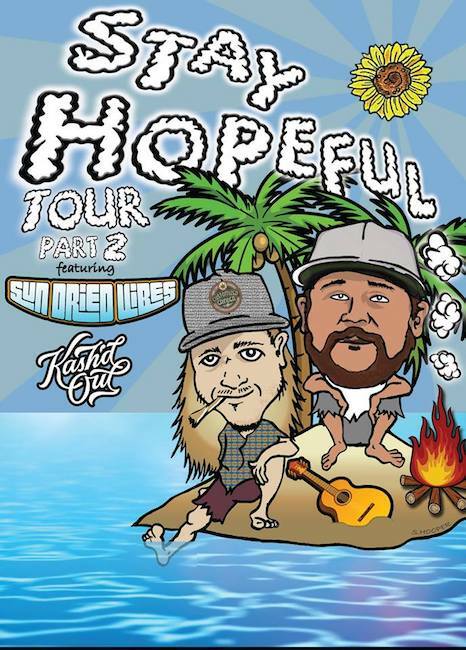 Kash'd Out and Sun-Dried Vibes have announced dates for their Stay Hopeful Tour Part 2 tour. The trek will head out mid November and go through a portion of December. No better way to start your holiday vibes then with two of the strongest up and coming bands in the scene. Kash'd out is currently out on tour with KBong hitting much of the West Coast. We also have learned Kash'd Out is working on new tracks which we will hopefully get to hear on their up coming tours. Sun-Dried Vibes is also about to head out on a few dates prior to the Stay Hopeful Tour in support of their new album also titled "Stay Hopeful". Recently released, this album is a must with excellent features including Rebelution, Treehouse!, Oogee Wawa, Bumpin Uglies and many others. See below for both bands tour dates as well as videos and music to get prepared for a stop near you.